Diffinity Genomics issued patent for their technology "Spatially inhomogenously functionalized porous media and method for use in selective removal of contaminants". The patent was issued June 23, 2015. 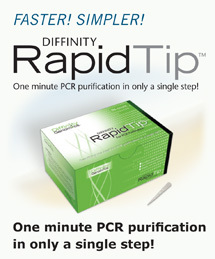 Diffinity Genomics™ has been recognized by The Scientist magazine’s “Top 10 Innovations of 2010” for its Diffinity RapidTip™ product designed to efficiently and rapidly purify amplified DNA from PCR product samples. The award is based on independent review by expert judges invited by The Scientist to evaluate new technologies launched in the life sciences this year. The Diffinity RapidTip was one of more than 60 products nominated by readers of The Scientist as being the best technology introduced in 2010. Molecular chemist Neil Kelleher of Northwestern University, sequencing pioneer Jonathan Rothberg, Princeton University genomicist Amy Caudy, and Pacific Northwest National Laboratory biologist H. Steven Wiley reviewed the entries in the Top 10 Innovations competition to narrow down the products to the 10 best. The Diffinity Genomics product was listed 4th following entries by prominent companies such as Pacific BioSciences, Sigma-Aldrich and EMD Millipore. “It is a great technology that saves time and effort in the lab while improving sample handling and experimental reproducibility. This would be great when using robotics”, comments Dr. Steven Wiley during his evaluation for the innovation award.